After a while, I decided a write a short blog post about Linux binary reversing CTFs in general. How to approach a binary and solving for beginners. I personally am not a fan of Linux reverse engineering challenges in general, since I focus more time on Windows reversing. I like windows reverse engineering challenges more. A reason me liking Windows is as a pentester daily I encounter Windows machines and it’s so rare I come across an entire network running Linux. Even when it comes to exploit development it’s pretty rare you will manually develop an exploit for a Linux software while pentesting. But this knowledge is really useful when it comes to IoT, since almost many devices are based on Linux embedded. If you want to begin reverse engineering and exploit development starting from Linux would be a good idea. I too started from Linux many years ago. Saying that since some people when they see a reverse engineering challenge they try to run away. So if you are a newbie I hope this content might be useful for you to begin with. Let’s first have a look at the ELF headers. The best way to learn more about this in detail is to check the man pages for ELF. Here’s in more detail. The “e_shoff” member holds the offset to the section header table. The “sh_offset” member holds the address to the section’s first byte. For this challenge you will need to decypher a simple XORed picture. This BMP picture was mistakenly encrypted. Can you recover it ? The file name is “ch3.bmp” and let’s open in a hex editor and see. 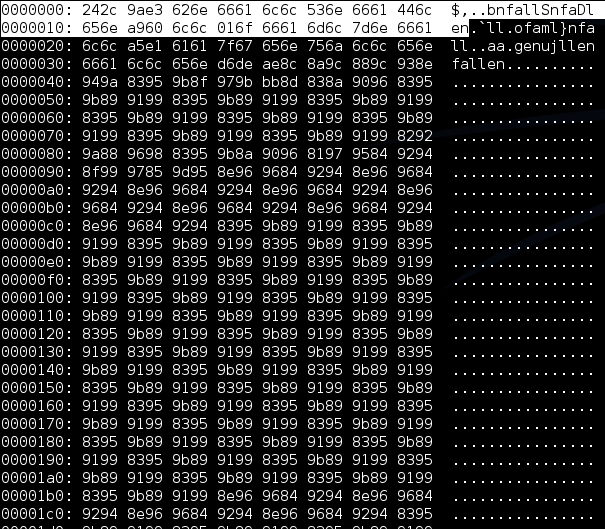 I first inspected the first 20 bytes and we can see a string saying “fallen”. Actually I guessed this key of length 6.